A textile student from the University of Southampton’s Winchester School of Art has won a major competition run by the RSA (Royal Society for the encouragement of Arts, Manufactures and Commerce). Twenty-two-year-old Charlotte Medin beat off stiff competition from across the country to gain an internship in Europe, sponsored by an EU funded project called ‘Digitex’. She’ll work with a new kind of textile printing process called ‘digital finishing’. “I’m thrilled to have won this. It is a unique chance to work in industry with a revolutionary new technology and hopefully get the chance to turn my design ideas into reality,” says Charlotte. Along with one other winner, Charlotte will spend five months later this year working with industry and developing her ideas in the textile design department at the Hogeschool Gent in Belgium. Her work will be presented at the Digitex conference in Italy in December 2010. The Digitex project is developing a new, versatile type of printing process which evolved from inkjet printing and enables chemicals to be applied to textiles in controlled quantities, on specific areas of garments or fabrics. In addition to applying colour and patterns, this ‘digital finishing’ also allows coatings, for example, which are water repellent, heat and UV sensitive (showing change in colour), anti-microbial and stain protective, to be applied to textiles in a unique single printing process. 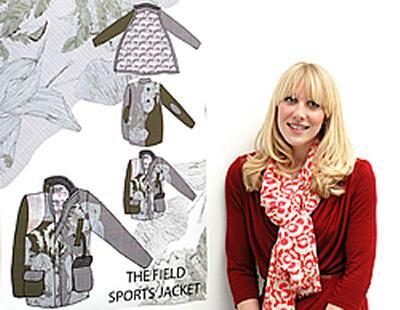 Charlotte won the annual RSA student design awards competition with a design for a high-tech field sports jacket, which would be breathable, waterproof, heat sensitive and warn the wearer of harmful UV levels. It incorporates an attractive fish design on the lining and remains true to traditional designs. She hopes to develop this further during her time in Belgium. Winchester School of Art encourages students in all its disciplines to work with the latest technology, and textiles students already have access to the latest industry standard Mimaki digital printer, which gives them the freedom to research and develop detailed designs on computer. “WSA is continuing to invest in the latest digital-equipment for our students, so they enter the jobs market well equipped to tackle the challenges of industry,” comments Head of WSA, Professor Bashir Makhoul.